Sudan, the culturally ambiguous country, or so people think. Rather than being ambiguous, Sudan is one of the most culturally diverse countries. Every region has its history, traditions, and is very racially diverse. The Nafisa project is all about introducing the cultural diversity Sudan has to offer, it all started with the designer’s fascination with her alter ego; Nafisa. Nafisa is a woman from the Khartoum/Jazeera Region. She was born in Altakala where she went to school. She is traditional but also has the tendency to defy expectations and has a mind of her own. She wears her hair in braids (mushat) and wears her favorite pair of earrings; fidaw. Nafisa has a story to tell, and so do all the characters in the Nafisa project. Each character represents a woman from a certain region in Sudan, each sporting their traditional dress and accessories. Through this project, the hope is to shed light on the richness and diversity of Sudan. The Nafisa Project is a fashion brand that is simple. Funky, traditional, and to the point. 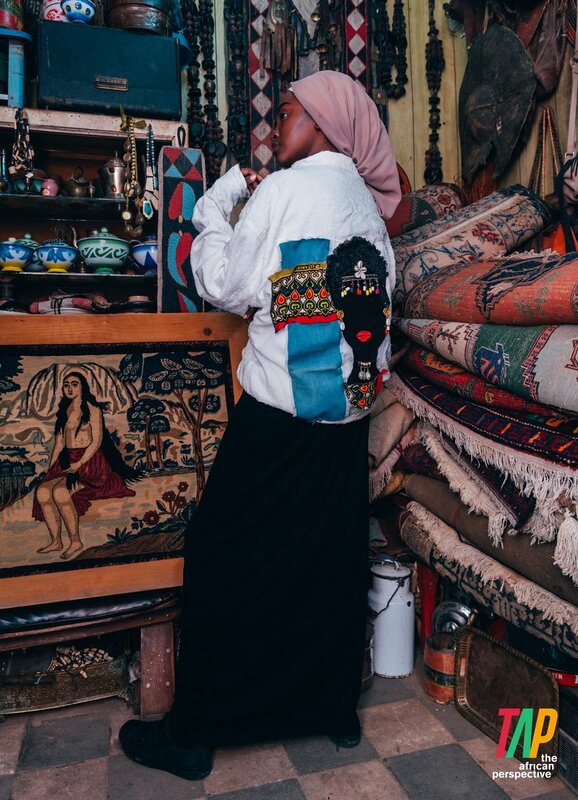 The first line consists of jackets with various characters on them, each representing a different region in Sudan. The The showcasing of her collection has been choreographed in a Sudanese setting and will show models sporting the jackets and wearing traditional Sudanese accessories in a setting reminiscent of Sudanese culture. The models will be asked to walk around in the space of the presentation and perform Sudanese customs. There will also be a small band of 3 playing Sudanese music to add to the general atmosphere. The presentation will run for 15-20 minutes, followed by a jam session by the band. Sahar is currently doing an East Africa media tour.